There seems to be no end to woes of lakhs of commuters in Mumbai as an indefinite strike by employees of the city's civic transport undertaking continued for the third day Thursday. Not a single bus of the Brihanmumbai Electricity Supply and Transport (BEST) plied on Mumbai roads since morning, an official said. Commuters complained that auto-rickshaw and taxi drivers were charging much more than normal rates. Some harried commuters also appealed to the Maharashtra government to take necessary steps to end the protest. A senior BEST official expressed hope of the stalemate getting resolved soon. 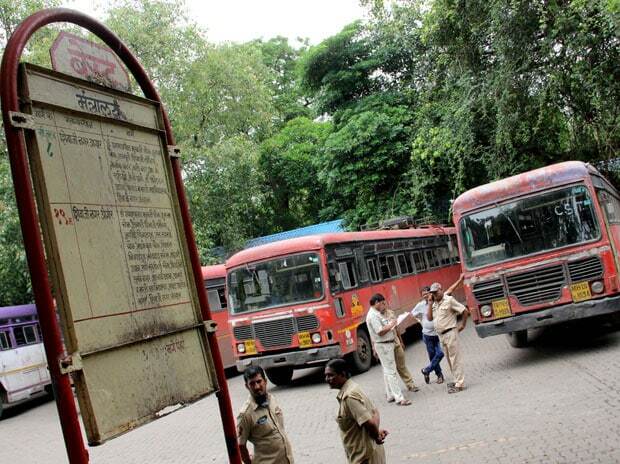 Nearly 32,000 BEST employees are on an indefinite strike since Tuesday over various demands, including higher salaries and merger of the budget of the loss-making undertaking with that of the Brihanmumbai Municipal Corporation (BMC). The state government had moved quickly to invoke the Maharashtra Essential Services Maintenance Act (MESMA) against the striking BEST employees, while its management asked them to end the stir and come to the negotiating table. The BEST administration had on Wednesday cracked the whip, issuing notices to over 2,000 staffers to vacate houses provided by the undertaking. It also held dialogue with BEST workers' union leader Shashank Rao, but it did not yield a positive outcome. Ashish Chemburkar, the chairman of the BEST committee that handles the day-to-day affairs of the undertaking, said they were going to hold meetings with representatives of the protesting staffers on Thursday. "We are hopeful of arriving at a concrete solution today. Everyone wants an end to this deadlock for the sake of Mumbaikars," Chemburkar told PTI. Another official said BEST's general manager was expected to hold meetings with union leader Rao, BMC Commissioner Ajoy Mehta and Mayor Vishwanath Mahadeshwar. Shiv Sena chief Uddhav Thackeray, who party rules the BMC, is also likely to intervene in the matter, he said. Passengers continued to face inconvenience and some complained that auto-rickshaw and taxi drivers were trying to fleece them. Vinod Dubey, who travels from suburban Andheri to Versova daily by BEST bus, said, "The auto-rickshaw and taxi drivers are charging two to three times more than normal rates, and if we refuse to pay that amount, they are denying us the ride. This exploitation must be stopped." A few commuters took to Twitter to express their anger, with some even appealing to Prime Minister Narendra Modi, Chief Minister Devendra Fadnavis and Sena chief Thackeray to resolve the deadlock. The BEST has a fleet of over 3,200 buses, which criss-cross the metropolis and also operate services in the neighbouring Thane district and Navi Mumbai. It is the second-biggest mode of transport in Mumbai after local trains, which ferry over 80 lakh passengers every day.